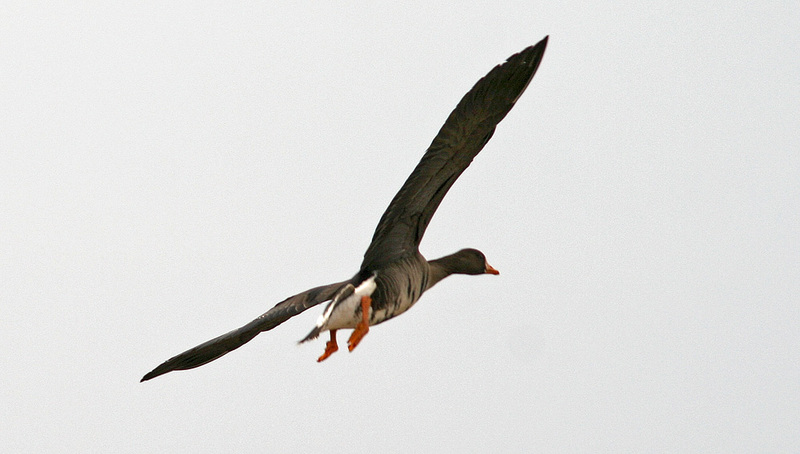 When I got news yesterday afternoon that a Greater White-fronted Goose had been found in Biscay Bay, the gears immediately started turning – How was I going to organize an otherwise busy morning to get down there and look for it?!?!? Greater White-fronted Geese are rare in Newfoundland, and while they do show up in both spring and autumn most “birders” have only encountered them in their more drab immature plumage as they often appear here in fall. Added to that, the individuals that have been recorded here are invariably from the Greenland race (flavirosostris) that normally winters in Europe, making them somewhat of a continental rarity. 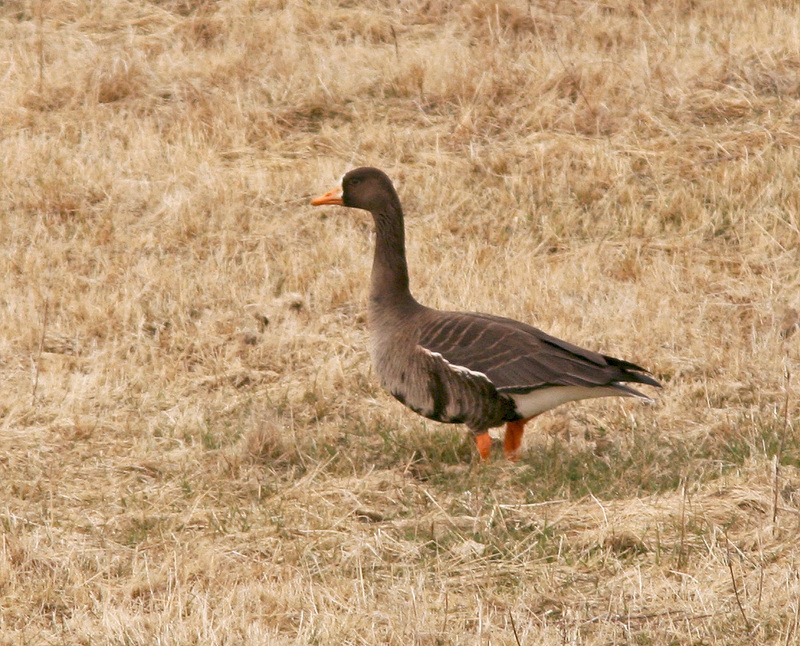 I’ve never seen Greater White-fronted Goose in Newfoundland, and just missed an opportunity to see two that showed up in Twillingate ~April 3 (I had been in nearby Lewisporte visiting family, but returned to St. John’s just hours before the news got out!). The sting of that recent miss motivated me to get things organized – and that, I did. After pawning off some family responsibilities to gullible in-laws, I arranged to join Bruce Mactavish and Ken Knowles on an early morning trip to Biscay Bay. 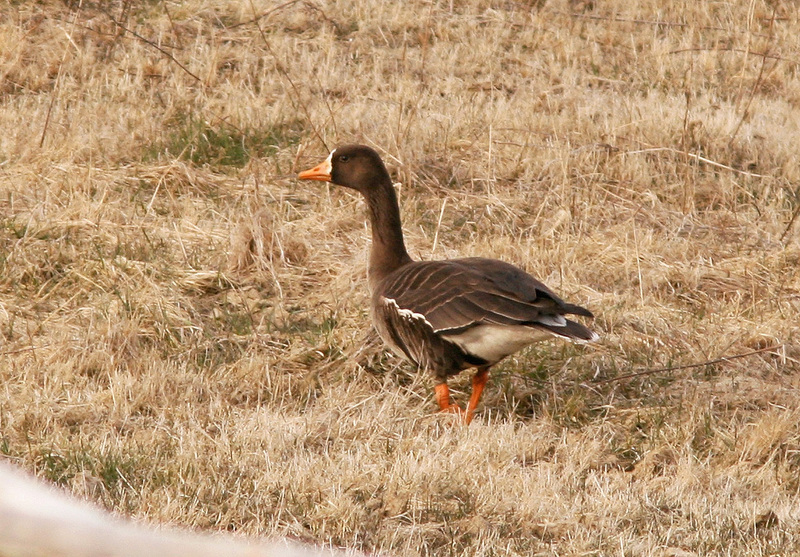 The overall dark upperparts, plain back (due to relatively thin white fringes on the mantle feathers and coverts) and orange-yellow bill indicate that this goose is of the flavirostris race that breeds in Greenland. Despite nagging doubts, we arrived and immediately found the goose grazing on fields about 75m off the road. It was very wary when the car slowed to a stop and flew to the furthest end of the field, staying ~100m from the road at all times and becoming alert every time a vehicle passed. Nevertheless, the rain held off and we got great views and decent (in my case only mediocre) record photos. At no point did we even venture to get out of the car for fear of scaring it back to the arctic! This American Golden Plover marked just the third spring record for Newfoundland – a great but unexpected bonus for the day. 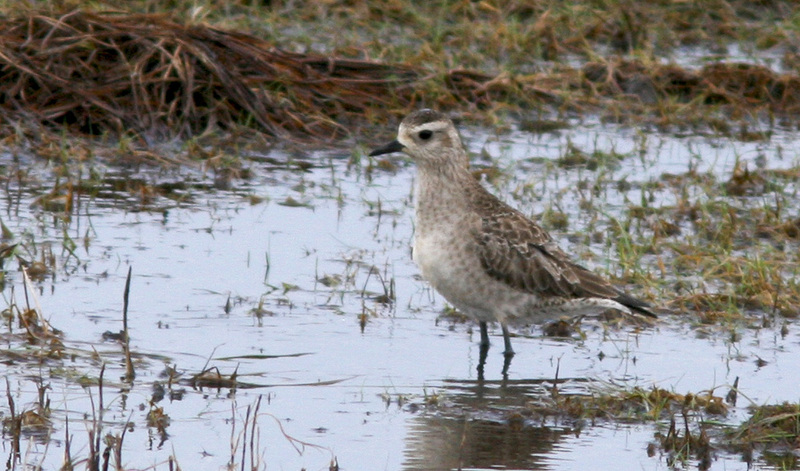 As an added bonus, we discovered a very dull American Golden Plover in a roadside pool at Portugal Cove South. 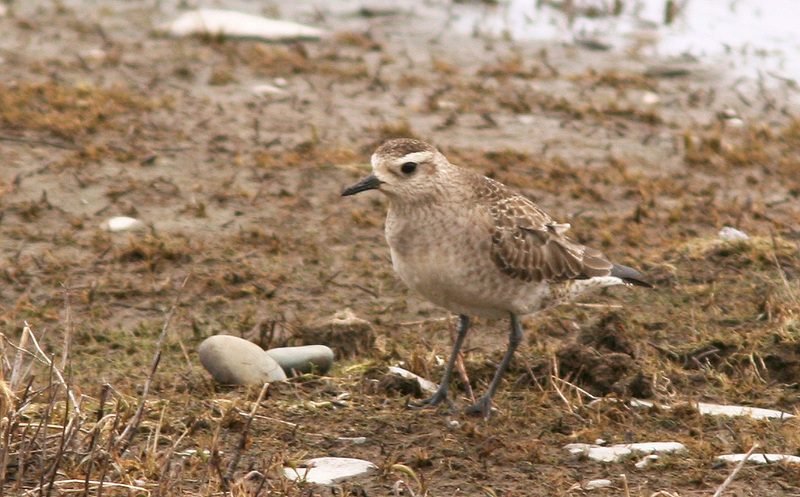 While European Golden Plover would have been the more expected and generally rarer species, this was just the third spring record for American Golden Plover in Newfoundland (which does migrate through the province in numbers during fall). There is one additional spring record from Labrador. Careful scrutiny of several other shorebird locations on the way home did not help us find much else on the day. The dull plumage of this American Golden Plover is in stark contrast to the bright breeding plumage that the more expected European Golden Plovers are wearing when they show up here in spring. This entry was posted in Uncategorized and tagged Anser albifrons, European vagrants, Greater White-fronted Goose, Greenland, Newfoundland, rare bird. Bookmark the permalink.